By (author) Patrick Hagerman Ed.D. Every triathlete wants to be faster, and most know that adding strength training to their programme will help them get there. In "Strength Training for Triathletes", fitness phenomenon Patrick Hagerman explains how small changes in muscle strength add up to big race results. For triathletes, the benefits of strength training are many, from increased stability in the water and on the bike to a faster metabolism. Stronger muscles can work longer before feeling fatigued, making strength training indispensable to endurance athletes.Clearly organised by discipline (swim, bike, run) and by muscle group, "Strength Training for Triathletes" helps athletes quickly find the best exercise for their unique training needs. Every exercise is accompanied by full-colour art, making the routines easy and inviting to follow.This groundbreaking book further explains how triathletes can adjust their workouts to emphasize endurance, strength, or power, and how to balance the three to reach race goals. It includes complete information on structuring a periodised weight routine to maximize results, whether the race the reader is preparing for is a sprint, Olympic, half-Ironman or full Ironman event. Sample seasonal plans for each race distance and instruction on how to adapt training plans to individual needs make it easy for readers to develop specific approaches and reach their personal goals.This is the only strength training book designed specifically for triathletes. It features more than 60 exercises organised by sport and muscle group. It is in full-colour throughout with comprehensive illustrations. Most athletes already know this, and as a triathlete, you probably know that strength also builds endurance. But traditional strength training programs are too general to benefit triathletes.In "Strength Training for Triathletes," fitness phenom and tri coach Patrick Hagerman demonstrates, with easy-to-follow exercises, how small changes in muscle strength add up to big race results. 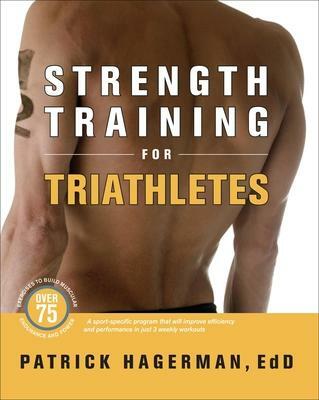 Hagerman's program of triathlon-specific strength training provides four essential benefits: - Greater muscular power- Increased speed in every triathlon leg- Reduced body fat with greater lean tissue mass- Increased muscular endurance with less fatigue This groundbreaking book includes comprehensive information on how to create a strength routine for best results, whether you're preparing for a sprint, Olympic, Ironman 70.3(R), or Ironman(R) event. Sample plans for each race distance and instruction on how to address your specific needs make it easy to achieve your personal goals. Illustrated exercises are organized by swim, bike, run, and core and grouped by upper and lower body so you can concentrate your routine on your particular weakness, or limiter. Endurance, strength, and power are the keys to triathlon. "Strength Training for Triathletes" is the complete resource for building and balancing all three for optimum performance. Dr. Patrick Hagerman was a recipient of the NSCA Personal Trainer of the Year award in 2002. Dr. Hagerman has coached for USA Triathlon and USA Weightlifting and has competed in triathlon, cycling, windsurfing, and adventure racing for over 25 years. He is a Fellow of the National Strength and Conditioning Association and a past member of its Board of Directors. He is the Director of Sport Skill Development for Qwest Personal Training.